Article - Building the 'Snap-On' Scorcher Built and written by rad22rad. The idea for the Snap-On Scorcher came about after a conversation with Tamiya 101.com member Volksrod earlier this year. We thought it would be a good idea to set our self a challenge for the next Tamiya101 DVD. 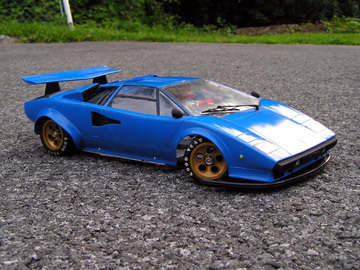 The challenge was for each of us to go away and build a Custom Scorcher in our own styles, but it had to have a Custom Body (With inner wheel arch liners ), Interior detail, and the Driver figure had to move. Another item we wanted to install was a full lighting kit as we wanted to do some filming of the cars running at night. This was not a competition between the both of us , we just wanted to see what we would come up with. Joe and I constantly sent each other progress shots to see how we were getting on. After many days of thought I had finally decided on how to modify the body. It would require plenty of plasticard sheets in different thickness, sections, rods, tubes and plenty of epoxy resin, super glue and car body filler. I wanted the nose of the car to drop away and blend with the top of the front wheel arches. To achieve this I had to cut out the entire bonnet moulding on the body with a Dremel tool , this just left me with the front wings and the thin windscreen wiper panel. Large plasticard sections were cut out to the shape of the bonnet opening to give me a base to structure the new bonnet on. A dashboard panel was also cut from plasticard to shut the back of the bonnet off. I then cut wedges of plasticard to simulate the curve I wanted on the bonnet. The nose of the bonnet had a radius section of plasticard fitted on and this would shape the bonnet front. The centre of the bonnet had a fuel cell cut out made from plasticard and fitted to the base of the bonnet. All of this was then filled with Car Body Filler ( Isopon P38 ). Once dry the bonnet area had to be filed and sanded down to the correct shape and had to blend nicely with the rest of the body. 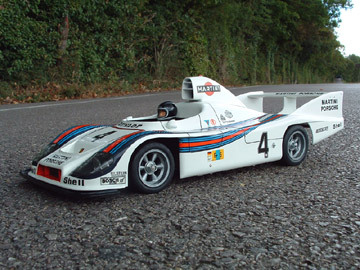 The front wings on the body were cut back to blend and flow with the radius on the nose of the bonnet and cut in at the backs to blend with the sides of the body. For the rear of my Scorcher I wanted to remove the engine lid moulding and replace it with a 1973 Porsche 2.7 RS style duck tail spoiler. This was done, by cutting out the old engine lid with a Dremel tool. Then a framework of two 1mm diameter stainless steel rods, one for the top profile and one for the bottom. These were bent by hand to the shape I wanted. Each wire form was glued to the body and plasticard sections were cut and glued in place to fill the 2 wire forms. Next the whole spoiler was covered in car body filler and left to dry. When dry the final shape of the spoiler was filed and sanded to shape. This was not an easy job. It took 4 attempts to get the shape right. Once I was happy with the shape of the spoiler I needed to blend the rear wheel arches to go with the spoiler. The arches were cut and radiused back and each arch was blended into the side of the body to match what I had done with the front of the car. I also removed all the roof rain gutters, rubber mouldings around all the windows, opened out the sunroof so it had no step inside and I also removed all the running boards on each side of the body. The fuel filler flap on the side of the body was also filled as I had modified a fuel filler cell for the middle of the bonnet already, and I also filled the holes for the windscreen wipers. The whole outside of the body was sprayed in grey primer , this showed all the errors on the body. All the problems were fixed and the body was once again primered to see if all was ok. This was the point in the build where I had to decide how to make a model with a working driver figure, an interior and a chassis housing all the electronics and running gear. The model needed to be easy to take apart to replace the battery and get to the electrics. The car would also be run on sand so the interior design had to allow for the sand to escape the interior. The best plan of action for me was to make a model with 3 stages. This enabled me to fully detail the inner skin of the body, dashboard and rear firewall. Again the liberal use of Plasticard sheet, rectangular, square, L section and tube sections were used throughout the interior skin of the body. I started work on the dashboard first. This was built up with plasticard sheets and given an edge with l section plasticard. I left an area where the steering column would pass under and would cut this away later when the driver/interior section was installed. 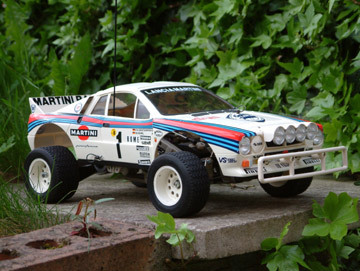 I used many parts for this car from an old Tamiya 1/12th Porsche 934 static kit I had. The Dashboard moulding from this kit was cut back, so I only used the area the dials were moulded on and glued this to the dashboard in the Scorcher. The rear firewall was the next part cut from plasticard sheet. The first section was cut to fit around the inside of the rear window neatly. I added various lengths of 1mm square sections to this part to give it a more interesting look. The next part of the rear firewall had to be shaped to allow the Chassis roll hoop to pass through the body and connect to the body clip on the roof of the body. The final part was cut from plasticard again and angled and fitted to the inside of the body. Once all of this was glued into place I started work on the foot well panels and inner wheel arches. All of these were first templated in paper and then copied in plasticard and glued into place. I added several plasticard strengthening flanges in this area also. The same was done for the rear engine bay area and the rear inner arches. Next I added doorframes and strengthening bars to the inside of the body, all of these were cut from plasticard sections and tubing. The roll cage was the next part to be made as I wanted this to be fixed to the inside of the body. First a 1mm diameter rod was hand bent to make a template for the roll cage sides. Once this was made thin walled 4mm diameter aluminium tubing was bent, using a bending jig to copy the steel rod templates. Cross members were also added to the roll cage and all of this was glued together. The roll cage was then test fitted several times to make sure it would fit after painting of the body had been done. The roll cage was then primered and painted silver. I had to custom make a front body mount to the body, so it could fix to the chassis without any body pins showing. This was made from a piece of L section plastic with a hole drilled into one end to accept a mounting pin on the chassis. The L section was heavily glued onto the underside of the bonnet. I had wanted to do a Snap-On paint scheme on this Scorcher from the beginning. The colours of the body had to represent that sponsor, so White, Red, Black, and Silver were used. Firstly the whole body was sprayed in grey primer. The primer was lightly sanded down and washed. Once dry Tamiya TS Pure White was sprayed on the inside and outside of the body, this was done in several coats to build up the colour. The paint was flatted between each coat, so it would be nice and level. This was left to dry thoroughly, approx 2 weeks. The red was next to go on and I used Tamiya TS Bright Red. The whole of the inside of the body was masked, as I wanted this to stay white. I uset Tamiya masking tape and paper to blank the inside of the body. Tamiya tape was cut into 1mm strips and used to mark out all the curves and straight lines. Then each area that was to be left white was masked in with Tamiya masking tape. All the edges of the masking tape were burnished down with a toothpick. Red was applied to the body in several dust coats. If they were sprayed on too heavy the red would bleed under the masking tape. This was left to dry for several days and then I sprayed the red on heavier to get a good depth of colour. The masking tape was then removed once the paint had dried and I was very happy with the results. The Snap On Decals were custom made for me by my Friend Lee, who makes all the reproduction decals for Tamiyaclub. These were cut out and fitted to the body and I also fitted other decals from Tamiya models, but only the ones that were coloured Red. White, Black or Blue. I also added some Snap-On decals to the interior. The whole body was then clear coated with Tamiya TS Clear. The body was given several coats, again rubbing down between each coat of clear. When the body had dried thoroughly the clear topcoat was flatted and polished down to a wet look shine. Now that the body had been painted I had to add all the fine details to finish it off. Firstly I gave all the door panel lines and rear engine grill detail a wash of thinned matt black Humbrol paint, this would make them stand out nicely against the white and red body. The silver painted alloy roll cage was now fitted and fixed into the body using epoxy resin. The dashboard had all the dial faces decaled using the decals from my old Tamiya 934 kit. All the dial bezels were detail painted silver and I added small warning lights to the dash also. I scratch built a radio unit with a wire to the dash, the radio was made from plasticard and the cable was a piece of fine wire wrapped around a paintbrush and painted yellow. All the other interior parts came from the 934 kit. Oil Tank, First Aid Kit, Water and Oil Tanks, Fuse Box and Tool kit. These were all built up, painted and fitted to the inside of the body. I used Braided hose and rubber tubing to plumb in all the oil and water tanks. I used a piece of window netting left over from a Tamiya Super Champ kit and sprayed this with Tamiya PS ( flexi polycarbonate paint ) and fitted it to the driver side window. Two number boards were made up from plasticard and these were glued into the rear side windows. I added my customary number 22s to each side. Next to be fitted was an Aluminium fuel filler cell to the hole in the bonnet. This was turned up on a lathe and then all the holes were drilled into it on a milling machine. All the details were painted into it and then it was glued into the bonnet. While I was working on the fuel filler cell I decided to fit a stone deflector to the bonnet to help protect the driver from flying stones. This was made with L section plasticard and a small piece of clear lexan. Small holes were drilled to the base of the L section and these were fitted with cut down pinheads, to look like rivets. I wanted to make a custom visor for the front screen opening. I firstly cut out a template from paper to get the correct shape. Then I cut out the same shape in 1mm thick perspex. This was then lightly sprayed with Tamiya PS Smoke to give it a tinted look. I then fitted one of my Awesome Alloys decals to it. Lastly to go onto the body were the Side mirrors and the internal rear view mirror. The side mirrors came from Tamiyaclub member Mike00top. These are custom aluminium mirrors which were masked on the mirror face and sprayed bright red. I fitted them to the body with rubber tubing, as this would enable them to move in an accident. The interior mirror came once again from the Tamiya 934 kit. This was fixed to the body with the same rubber tubing as the side mirrors. The chassis was a modified version of the classic SRB item. All the cast components were cleaned primered and painted gold. These were all built up as usual, but using stainless steel screws, ball races and a brass Super Champ idler gear. I removed all the torsion bars and springs from the suspension. The main chassis plate was a Twinset alloy item that was heavily drilled out to reduce a bit of weight. The front suspension and gearbox assembly was fixed to this chassis. I used Super Champ servo saver and steering rods as they are much stronger than the standard ones. New holes for the servo mounting brackets were drilled into the chassis and an Acoms servo fitted to the steering rod. I was kindly given some Alloy front and rear bumpers by my good Friend J-man on Tamiyaclub. The front bumper was modified, by adding a machined alloy skid plate. The front bumper bar was sprayed white to go with the body colour. I also added some spotlights from a Hi Lift kit to the front bumper. These were masked and sprayed matt black on the outside. The Alloy rear bumper was also sprayed white to match the front item. These were both fitted to the chassis carefully. There was a large gap between the rear bumper and gearbox casing, so I decided that would be a good place to store the emergency spare tyre and set up a rear light bar. A Rough Rider front wheel fits perfectly into the gap and this was fixed to the rear bumper with a handmade clamp plate and then secured with a machined alloy 3 pointed gold lock nut. The rear light bar was made from parts in my spares box. I found an old Tamiya 1/6th scale Honda CBR with some great looking indicators. These were used to make the rear light bar. The clear orange lenses were painted clear red and the indicator backs were drilled to accept tiny LEDs. I made a small alloy bracket and fitted the light bar to the gearbox casing. I used a Tamiya TLU01 lighting kit for the lights and all of these were wired up to the spotlights and rear light bar and then neatly tidied up around the chassis. All the exposed wires were painted matt black to resemble a wiring loom. The unit was powered up and all worked well. I fitted some custom made exhausts and silencers either side of the rear bumper, these were made by Tamiyaclub member Mike00top. The next item to be fitted to the chassis was the receiver and speed control and all of these were neatly wired in. It was very important to keep the wiring neat, as the space in this model would be very limited. The battery was installed and held in place with some Velcro straps. I made 3 pillars from alloy bar to hold the driver/interior section in place and these also held the battery in place. The final part to be modified on the cassis was to make a front body mount pin and this was made from some alloy bar and fitted to the top of the steering servo saver shaft. To finish the chassis off I opted to use Rough Rider Wheels and tyres. I fitted some Awesome Alloys Rough Rider Box Art Alloys. The tyre lettering was painted in matt yellow, as this is the colour I use for all my Custom Models. Not standard white as in Box Art examples. The rivet detail in each alloy wheel was painted with clear red to bring out the detail and finished off with a red anodised wheel nut. I also fitted an Awesome Alloys alloy SRB contoured skid plate to the base of the gearbox. Now the body and chassis were finished and test fitted together I could see what room I had left to make the driver/interior fit into the rest of the body. The base of the interior came out to approx waist height on the driver. I made several paper interior bases and test fitted them onto the 3 pillars holding the battery on the chassis. Once I was happy that the paper templates fitted the chassis and body I made a plasticard copy. This was drilled to accept the 3 pillars and mounted to the chassis. I realised I would need to make a higher section in the middle of the base, because the battery connector had no room under the interior base. A section in the middle of the base was heightened by 7mm to accept the battery connectors. 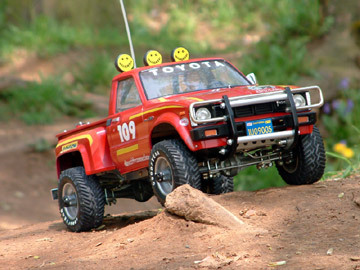 I used a driver figure from an old Tamiya Hilux kit and cut it down to the correct height for the model. The head area on the body was drilled out to 7mm diameter to allow for servo attachment to the head. A micro servo was fixed to the inside of the body and a rubber tube cut to the correct length for the head was fitted to the servo horn. The driver figure was test fitted to the interior base and glued into place when he was in the right place. I angled the sides of the base down about 15 degrees each side to how more of the inner body details I had made and this also acted as a way of removing trapped sand away from the interior when the car was running. Next thing to do was make a steering servo platform, where a micro servo would be fitted to power the steering wheel. This was made with plasticard and had to be test fitted many times to fit inside the body neatly. The servo was fixed on and a length of alloy tubing was fixed to the servo horn to act as a steering column. I used a steering wheel from the old Tamiya 934 kit as it was a perfect scale for this model. The whole of the driver/interior was sprayed Matt Black in preparation for painting the driver. I chose to use a Driver head from a Wild One kit as I just love the aggressive look of that Arai Helmet. The helmet was sprayed in several colours and the face and rubber detailing on the helmet were hand painted. I wanted the driver to have goggles as this would be needed for a car without a front windscreen. I found this part in my spares box again and it was a set of goggles from a 1/12 Tamiya BMW Paris Dakar model. I had to modify the rim slightly to make it longer as the scale was slightly wrong. Then I added some lenses and tear offs to the goggles. I made a goggle strap from Tamiya Masking Tape and painted that in. The Driver body was now detail painted and I added some shoulder stubs from plasticard to connect the drivers arms to. The head was now fitted to the body servo and the servos were tested. Unfortunately they all worked in reverse, so I had to get a servo reversing lead for each servo and this fixed the problem. Now came the arms, these had to be flexible and move when the steering servo operated. I cut the hands from the drivers arms and these were fixed to the steering wheel. I found some nice white cotton gloves that would stretch and were the correct diameter for the arms. The index finger on each glove was perfect, so these were cut off to the correct length for each arm. The inside of each arm was made from rolled up aluminium foil and the elbow and shoulder joints made from rubber tube and fixed to the alloy foil arms. The shoulder joints were fixed to the driver body. The cotton sleeves were then pulled over each arm and glued to the shoulder and the hand on the steering wheel. The action was tested again and the effect was just Awesome. I added some extra details to the interior base such as, Battery, Wiring loom, Electrical Boxes, Fire Extinguisher System, Gear lever with rubber boot and water bottles. I needed to make a seat for the driver and this was made from 2 seats from the trusty 934 kit. The side of one seat was cut and the opposite side of the other seat was cut and the two parts glued together. This made the seat the correct width for the driver. The seat was cut to fit to the interior base and the correct height to suit the driver. I made a headrest from plasticard and a plasticard framework for the back of the seat. The Driver was treated to a seatbelt harness made from vinyl tape and some felt pieces for the belt shoulder straps. All the servos wires were given enough length so the driver/interior section could be removed for battery change without disconnecting all the electrics. A final test showed all worked well and the model was finally built up. This Model was run this year and has been filmed running in the day and night on the sand dunes. 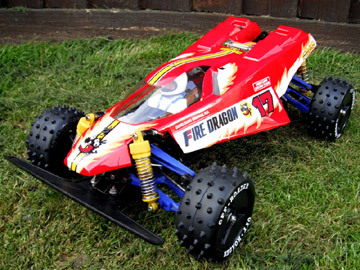 It will feature in the next DVD from the Guys on Tamiya101.com. This model was a big challenge to get done in time for the filming. I nearly gave up on building this model so many times, but I am glad I kept on with it to the end and managed to get it all on film too.